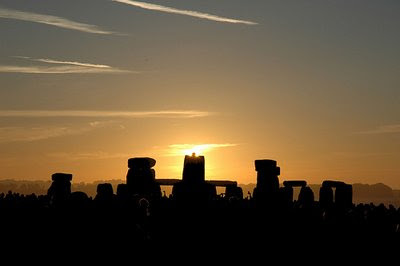 Summer Solstice (5:45am): Stonehenge right?! Celebrate the beginning of the longest day of the year by dressing up to look like an extra from Lord of The Rings and hanging out around some 5000 year old stones , getting cold, watching the clouds, beating some drums and through your cider haze wondering what it all means and why we're all here (especially the stones) etc etc. Alternatively, set your alarm and then take great pleasure in staying in the warmth and comfort of your bed sparing only a second of thought for those standing in the rain around some ancient stones. Yeah, I know, I'm getting old! Loads to see this week! I'm going to take the opportunity to get my little dance on at Dengue Fever at Scala but if I wasn't there then I would be at The Lexington watching We Were Promised Jetpacks - such a great name for a band. It's also well worth grabbing an ice cream and taking it for a stroll along the Southbank this week with the beginning of Meltdown 09, see here for more info. Whatever you get up to, have fun! Incidentally, We Were Promised Jetpacks have a new album out today on Fat Cat Records called 'These Four Walls' and a new single 'Roll Up Your Sleeves' out June 29th.